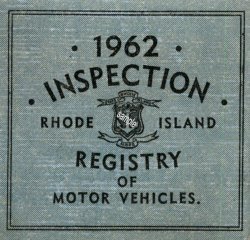 1962 Rhode Island Inspection Sticker - $20.00 : Bob Hoyts Classic Inspection Stickers, Add a Final Touch to your Restoration! This 1962 Rhode Island sticker measures 3 inches x 3 inches and is a beautiful reproduction of the original sticker. This sticker comes with our peel and stick format that allows for adhering to the inside of the windshield on the passenger side. Rhode Island stickers do not indicate the month of issue or expiration. The back has Motor or serial number along with date inspected.